Periodic Table What is the element Silicon as on the Periodic Table? A non-metallic element occurring extensively in the earth's crust in silica and silicates, having both an amorphous and a crystalline allotrope, and used doped or in combination with other materials in glass, semi-conducting devices, concrete, brick, refractories, pottery, and silicones. Silicon is much more abundant than any other element, apart from the Oxygen. The Atomic Number of this element is 14 and the Element Symbol is Si. Elements can be classified based on their physical states (States of Matter) e.g. gas, solid or liquid. This element is a solid. Silicon is classified as a "Metalloid" element and is located in Groups 13, 14,15, 16 and 17 of the Periodic Table. An element classified as one of the Metalloids has the properties of both metals and Non-Metals. Some are semi-conductors and can carry an electrical charge making them useful in calculators and computers. For additional facts and information refer to Silicon Properties. 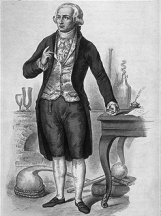 Silicon was was first identified by Antoine Lavoisier in 1787. Humphry Davy thought in 1800 that silica is an element, not a compound, and in 1808 suggested the present name. Re-discovered by Jons Berzelius in 1823. Silicon resembles Carbon in many respects. It can be obtained in several allotropic forms, corresponding to those of carbon. The crystallized form is very hard, and is inactive toward reagents. The amorphous variety has, in general, properties more similar to charcoal. Next to oxygen silicon is the most abundant element. It does not occur free in nature, but its compounds are very abundant and of the greatest importance. It occurs almost entirely in combination with oxygen as silicon dioxide (SiO2), often called silica, or with oxygen and various metals in the form of salts of silicic acids, or silicates. These compounds form a large fraction of the earth's crust. Most plants absorb small amounts of silica from the soil, and it is also found in minute quantities in animal organisms. The high-tech region of Silicon Valley, California, is named after this element. When Sodium and Calcium silicates, together with silicon dioxide, are heated to a very high temperature, the mixture slowly fuses to a transparent liquid, which on cooling passes into the solid called glass. Check out Silicon on the Periodic Table which arranges each chemical element according to its atomic number, as based on the Periodic Law, so that chemical elements with similar properties are in the same column. Our Periodic Table is simple to use - just click on the symbol for Silicon as on the Periodic Table for additional information and for an instant comparison of the Atomic Weight, Melting Point, Boiling Point and Mass - G/cc with any other element. An invaluable source of facts and information as a Chemistry reference guide. The Standardised Periodic Table in use today was agreed by the International Union of Pure Applied Chemistry, IUPAC, in 1985 and now recognises more periods and elements than Dimitri Mendeleev knew in his day in his day but still all fitting into his concept of the "Periodic Table" in which Silicon is just one element that can be found. These articles contain facts and information relating to Silicon and each of the other elements including the Periodic Symbol, group, classification, properties and atomic number which is often referred to as the Periodic Table Number. Test your knowledge of chemistry and the Periodic Table by completing the Element Symbols and Atomic Numbers on our Blank Periodic Table. Chemistry students will also find a helpful section on Chemical Formulas.